Today is officially the last Friday of 2011 (sigh). As such, today's first line is the last piece of prose to roll around in your mind as the clock strikes midnight tomorrow night. And, it's a dandy. "If I am out of my mind, it's all right with me, thought Moses Herzog." Great opening line, right? Well, it's from Saul Bellow's "Herzog." Again, it's short (15 words), but says so much. And I love love love the name Moses Herzog. Moses Herzog? Are you kidding me? Great name. But listen. The real reason that this first line is so astounding is that, after reading the whole novel, one realizes that this 15 word introductory sentence is basically a prolific summary of the novel as a whole; a novel where the reader, and the protagonist himself, wonder aloud whether or not Herzog's mind is slipping, and, if his mind has indeed slipped, is it all right to be out of one's mind? 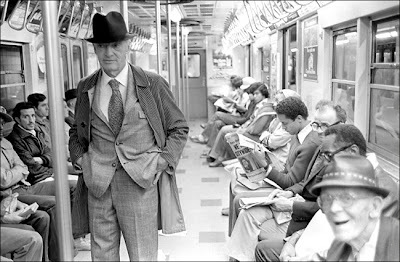 One more plug: Herzog is far and away my favorite Saul Bellow novel. I've struggled with many of Bellow's novels (especially Augie March), but absolutely loved Herzog. Happy Bellovian New Year . . .